Mom Notes would like to welcome two new mommy bloggers, Steffi and Kelly, both of whom I also consider good friends, aboard! Work and duties at home make it a little more challenging for me to update and even though I vow to post something whenever I can, two new minds and two extra sets of hands should keep Mom Notes alive and kicking. We aim to inspire other moms by sharing our experiences and hopefully, new knowledge and useful/fun/practical information, too. Let me first introduce Steffi who, like me and Mommy Kelly, is also a stay-at-home mom. We actually met at a local online community for writers and although we may no longer be active in said community, our friendship remains. The bond of motherhood and the things we go through as online writers also have a lot to do with it. 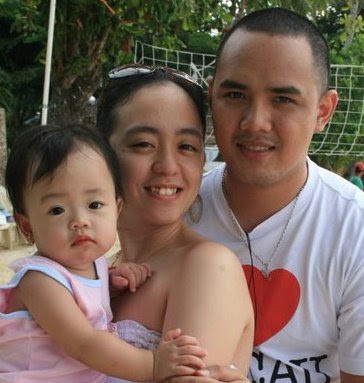 Steffi is mother to Holly, who will turn 1 next month, and happily married to Jayson. Young as she is at only 20, Steffi is perhaps the most hardworking of us three. She has clocked hundreds of hours on oDesk, got articles published on important and popular freelancing sites, has been featured on some, is business-minded, and runs The Freelance Pinoy, a blog for pinoy solo professionals. · How did it feel when you saw Holly for the first time? I was very, very excited to see her, despite the fact that my ob-gyne was literally sewing my belly up after the C-section. It was a miracle in itself to have been able to see the being that grew in my stomach since Day 1 for the first time. Being able to watch your baby grow and discover the beauty and wonder of the world, especially when she discovers it by herself. · As a mom, what areas do you think you need to work harder on? At the moment, I find it difficult to be more patient with my daughter, learning how to calm down during times like sickness and sudden falls or bumps to the head, and giving my daughter more of my time during the day. The family should be together (must be living under one roof). While the parents work, the kids are either in school or doing their own useful activities in their rooms. When it’s time for meals, the family comes together and talks about their day. No cell phones, no TV, no other technology to distract anyone’s attention. There’s time for family outings, time for important family discussions, and of course time for studying, praying, and learning together as a family. · What are some of the most endearing things about little Holly? She loves munching on cookies and biscuits, she watches attentively when someone talks or does something, and she has this inner love and affection for other kids. She always crawls to her cousin or 4-year old uncle for example and hugs them, even without me encouraging her to do so. Oh, and she’s not afraid of getting hurt or falling. She’ll only start crying when something five times her size gets close to her. Are you and your husband planning on having more children? · What are some of the things you want/don't want for her? · What kind of relationship would you like to develop with Holly and your future kids? An honest one, that’s for sure. I’d want my kids to grow up knowing what they want in their life, so I want to be there to support them, to show them the pros and cons of their decisions, and to be there during their greatest and darkest moments. 8AM to 12NN – Check emails, update social media, play Cityville a bit, bath, and work. Holly’s asleep at this time. · Aside from motherhood, what keeps you busy? I’m a freelance copywriter and avid blogger, so I’m usually busy working on my freelance projects, blogging for The Freelance Pinoy, or updating my social channels by responding to mentions, comments, and the like. When I’m done with all this, I would read, listen to music, or take a break outside of the home office. Discipline, using my task management app, and telling myself that if I don’t finish this, I won’t be able to spend time with Holly. · Any future career plans? Hopefully, after graduating from school, I’ll be able to become a full-time freelance writer. If not, I’d like to try getting a writing job at Summit Media. I love reading Cosmo, Gadgets, and Entrepreneur. :) Working Mom is also a good magazine to aim for but I don’t know what company it belongs to. · How do you like spending your alone-time? Being able to sit down together and just talk about anything besides the business, Holly, and everything else that’s not about us. Oh, and being able to travel and visit interesting places together (this is my more expensive preference hehe). · Who are your female role models? My mother, because she’s one of the most experienced mothers I’ve ever met. I also admire my grandmother, who has been working non-stop for her family and yet finds time to be generous and devoted to God and to her employees, friends, and others who are good to her. If you have older kids, chances are, you may have already forgotten a lot about infant care. Mommy Steffi can help refresh your memory about all sorts of things from vaccinations to the intense emotions you used to experience when separated from your newborn. She also makes great baby product recommendations. Steffi likes online shopping, blogging, and playing video games. She's been married for over a year and will continue taking up Literature at the De La Salle University next semester. Steffi loves animals and cares for a black poodle named Chico. She is also a frustrated veterinarian. Visit Steffi's personal blog and her portfolio.